What Were They, How Do We Understand Them, Where Do We Go? In a short span of twelve weeks between mid-February and early May 2006, an estimated 3.7 to 5 million people took to the streets in over 160 cities across the United States to rally for immigrant rights. Marches and demonstrations were organized from Anchorage, Alaska, to Miami, Florida, and forty-two states in between. The marches brought together groups large and small, from the 24 people counted at a protest in Anchorage to as many as 700,000 people in the streets of Chicago and Los Angeles. Often wearing white T-shirts, waving American flags and, at times, flags from their homelands, the marchers included people of all ages, from babies in strollers and teenagers walking with their parents to gray-haired seniors in wheelchairs. The marchers spanned economic conditions and came from all walks of life, from day laborers and janitors to professionals and politicians, including the future U.S. president, Barack Obama. Together, they chanted slogans such as "Today we march, tomorrow we vote," and "¡Sí, se puede!" (Yes, we can!). The majority of those who took to the streets were Latino, but people of European, African, and Asian heritage marched too. The group of "Latinos" who participated was diverse, including immigrants from over a dozen Spanish-speaking countries, their U.S.-born children, and Chicano or Hispanic Americans whose families' U.S. roots stretch back a hundred years or more. The sheer scope of the protests and the numbers involved are of historic proportions. During the heyday of the civil rights movements, in 1963, 250,000 people flocked to the Mall in Washington DC to hear Martin Luther King Jr. (JBHE Foundation 2003). In 1969, those who marched on Washington to protest American involvement in Vietnam numbered between 250,000 and 320,000 (Cicchetti et al. 1971). Looking back to the nineteenth century, some 300,000 to 500,000 people took to the streets to militate for labor rights, culminating in the famous Chicago Haymarket protest of 1886 (Avrich 1984; Foner 1986). Strikingly, none of these prior protests-historic moments in the annals of contentious politics in the United States-matched the largest May 1 rallies for immigrant rights in 2006. Beyond the United States, the marches of 2006 were likely the largest protests over immigrant rights seen in the world, and they probably figure among the largest demonstrations held in Western nations in recent decades. Especially noteworthy, the 2006 U.S. mobilizations were peaceful and without a major violent incident: there were no demonstrator/police mêlées, not a single person died, and not a single car was burned, unlike other twenty-first-century protests and riots over immigrant rights and race relations in cities such as Birmingham, Paris, and Sydney. The scope, scale, and peaceful nature of the protests demand explanation; this is one of the goals of our volume. Activism outside "normal" electoral or institutional politics suggests that standard political science accounts of behavioral politics or Latino/minority politics must be expanded beyond voting or contacting elected officials to include contentious action. At the same time, the protests do not quite fit within existing social movements scholarship: the strategies used were tried and true tactics employed by past social movements, but the nature of the 2006 mobilizations was unusual. The protests rapidly ballooned to unimagined proportions, were sustained for about three months, but then collapsed as quickly as they started. Why, like a July 4 fireworks display, did the marches ends as abruptly as they began? It is unclear whether the 2006 protests better represent "spontaneous" collective action, as articulated by an older generation of social scientists and recently retheorized (Killian 1984; Biggs 2003, 2005), or a "sustained" movement in line with most contemporary political process and new social movement models of contentious action. Much of the research reported here suggests that the rapid, large-scale mobilization arose, in part, due to the loose network of local groups who received support from actors like the media or Catholic Church, organizations that could send widespread messages about the protests. We also suggest that the protests were animated by an almost paradoxical mix of threat-from legislative action against undocumented immigrants and anti-Latino or anti-immigrant sentiment more generally-and faith in the political system. Perhaps for this reason, there is evidence that some of the energies animating the 2006 street protests became channeled into 2008 electoral participation. These dynamics, if accurate, reinforce social movement scholars' argument about the importance of organizations for contentious politics. However, they challenge the idea that, for mobilization, social movements need openings in the political opportunities structure-2006 was more about threat than opportunity-and they challenge hard and fast distinctions between contentious and electoral political engagement. The 2006 protests were remarkable in another way: they focused on, and were in substantial part animated by, people without citizenship in the political system they challenged. Most studies of formal politics take for granted the citizen-actor, an individual who holds political rights and who may act independently, as a voter, or in a collective, as part of a civic association, political party, or interest group. Those who are foreign-born, particularly those without citizenship and especially those without legal residence, are absent from standard, institutional accounts of political engagement. Noncitizens also tend to be absent from studies of social movements. Social movement scholars devote their energies to studying the political actions of those who, in the classical language of social movements, are "challengers," forced to engage in contentious action because they see few opportunities in the formal political system (Tilly 1978). This characterization perfectly suits noncitizens' activities, yet the assumption undergirding most studies of social movements is one of the protesting citizen. Protesters might have second-class citizenship, as was the case for African Americans, but they are nationals of the countries where they advocate for change. They can be jailed, attacked, and obstructed in their protest activities, but they cannot generally be thrown out of the country altogether. This is the case for a noncitizen migrant. In the United States, an estimated 11 to 12 million unauthorized migrants lived in the country in 2006, and another 14 million noncitizen legal residents-from international students to permanent residents who have made the United States home for decades-face an additional form of repression not seen in most social movements. They can be summarily removed from the society in which they are protesting and be deported, ripping families apart and tearing a person away from his or her livelihood and community. What would possess people who have everything to lose by coming out into the limelight to march, even though the cost could be permanent and definitive exclusion? Noncitizens are invisible from most political struggles in the United States, but the 2006 protests rendered them visible. The language of visibility-what worked to frame these individuals' struggles, and what didn't-deserves careful attention. Our preliminary conclusion is that the most successful framing of the movement centered on American values of family and work: immigrants are members of families and hard workers who do not deserve to be seen or treated like deportable criminals. In contrast, frames that hinted at foreignness, such as appeals to home-country pride, America's immigration history, or even human rights, found limited traction in the court of public opinion and mainstream media coverage of the protests. The American public, it seems, need immigrants to make appeals to their Americanism. From the viewpoint of some contributors to this volume, the 2006 rallies also mark a crystallization of a new Latino identity that brings together multiple generations whose roots in the United States might date from a few years to more than a century. 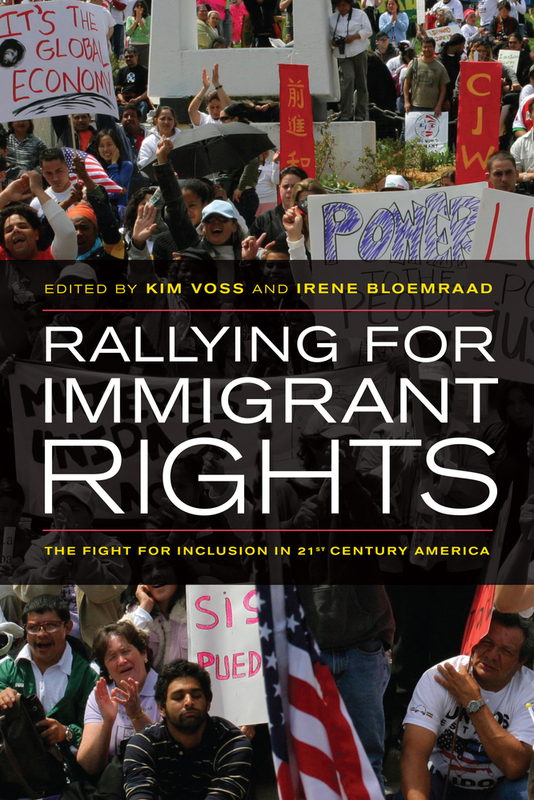 In the remainder of this chapter, we provide some background to the events of 2006, and we make the case for why the immigrant rights rallies offer an important lens onto critical questions of citizenship, social movements, politics, and identity. We sketch out key ways to understand the protests and highlight the various institutions and processes involved in this moment of mass mobilization. We then take a step back and ask about the consequences of the protests, for American politics and for immigrants and Latinos in the United States, as well as for academic scholarship within sociology, political science, and related disciplines. In doing so, we highlight the contributions of the other chapters in this volume, which address the question of why and how the protests occurred as well as their consequences for the future. In a world where globalization has spurred dramatic increases in the number of international migrants, even as immigration policies grow more restrictive in many places, the practical and theoretical issues raised by the 2006 protests present pressing dilemmas for scholars and citizens around the world. The immediate catalyst of the 2006 spring protest wave was the passage of the Border Protection, Antiterrorism, and Illegal Immigration Control Act, also known as H.R. 4437, on December 16, 2005. Representative F. James Sensenbrenner, a Republican from Wisconsin, first introduced the bill on December 6; ten days later it passed the House of Representatives with a vote of 239 to 182. The bill, which the Congressional Budget Office estimated would cost almost $2 billion dollars between 2006 and 2010 alone, counted among its provisions a substantial investment in border security, including almost seven hundred miles of double-layer fencing, increasingly high-tech document control, more cooperation between the Department of Homeland security and local law enforcement, and stiffer penalties for employers hiring illegal migrants. Even in the context of greater congressional concern over security and border control in a post-September 11 environment, the bill was widely perceived as draconian, in no small part because it would make living in the United States without valid legal documentation a crime rather than the civil offence it currently is. The provision would have not only criminalized anyone who committed an immigration violation, even a technical one without intent to violate the immigration laws, but it also threatened to criminalize anyone who assisted illegal aliens, including those working for religious, humanitarian, or social justice organizations that might offer legal aid, social welfare, or sanctuary to people without proper documents. Passage of H.R. 4437 sent ripples of anxiety through immigrant rights, union, and religious networks across the country. By February 11, 2006, roughly five hundred Latino leaders from labor unions, churches, community-based organizations, advocacy groups, and universities met in Riverside, California, to plan a nationwide series of protests (see Wang and Winn, this volume). These activists wanted to influence the expected spring debate over immigration legislation in the U.S. Senate. The ripples rapidly grew in amplitude and began to be visible to the wider public. The first wave of protests reported in the media occurred between February 14 and 22 in Philadelphia, Georgetown, Delaware, and Fort Myers, Florida, drawing between 1,000 and 5,000 participants. On March 1, Cardinal Roger Mahony of Los Angeles used his Ash Wednesday address-a choice that was a striking religious and symbolic message-to call on Catholics and other concerned citizens to defy H.R. 4437 should it become law. The wave of protests then grew at a furious pace, with 20,000 to 40,000 rallying in Washington DC on March 6, followed by a massive demonstration of 100,000 to 300,000 protesters in Chicago on March 10. The storm of immigrant rights rallies had begun. Upwards of 260 separate demonstrations occurred in the subsequent two months, with most clustering around three distinct time periods: March 23-31, April 9 and 10, and May 1. Table 1.1 highlights the largest twenty demonstrations that occurred between March 23 and May 1, 2006. Eight of these rallies attracted at least 100,000 participants, with perhaps half to three-quarter million people marching in the streets of Chicago and Los Angeles on May 1. The symbolism of May 1 might have been lost on some American observers, but the date is highly significant: currently known as International Workers' Day, this day of labor protest and celebration of workers' rights originated in the United States with the Haymarket Riots of 1886 in Chicago. The theme of work, and the economic contributions made by immigrant workers regardless of legal status, was a prominent theme on placards held by demonstrators and in speeches addressed to the marchers. As one banner said, "We are workers, not criminals!" (Reid 2006). The wave of protests also spread to new places not historically known for activism around immigrant rights or, for that matter, not known as places of migration at all. During the spring of 2006, demonstrations occurred in towns large and small across the South and Midwest. Tens of thousands took to the streets in Fort Meyers, Florida, and in Atlanta, while smaller rallies occurred across the Carolinas, in Tennessee, as well as in rural Nebraska and Kansas. For example, Schuyler, Nebraska, a small town of 5,300 souls, saw 3,000 people rally for immigrant rights (Wang and Winn, this volume). The broad geographic scope of the demonstrations, shown in figure 1.1, reflected the new and growing dispersion of immigrants, and especially Latino migrants, throughout the United States (Singer 2004a; Zúñiga and Hernández-Léon 2005; Massey 2008). As with many powerful storms, this one died quickly, at least from the public eye. Indeed, the demobilization of the marchers was as dramatic as their mobilization. Few rallies of substantial size occurred in the months and years following May 2006. The immediate goal of many marchers-to kill H.R. 4437-succeeded. The Senate refused to consider the legislation. But the marchers failed to spur more proactive legislation. On May 26, 2006, the Senate passed S. 2611, the Comprehensive Immigration and Reform Act, which would have created a path to legalization for undocumented migrants, but the bill died and alternative bills during the summers of 2006 and 2007 suffered a similar fate. At the time of this writing, in spring 2010, there still has been no comprehensive immigration reform. President Barack Obama has signaled an interest in pushing for such a bill, but responding to the severe economic recession, foreign policy, and health-care reform have taken center stage early in his administration. Just as no one predicted the fall of the Berlin Wall in 1989, no scholar or political commentator predicted the scale and scope of the spring 2006 protests. With the benefit of hindsight, however, we can identify a number of precedents, including Chicano, worker, sanctuary movement, and immigrant rights activism, which laid the groundwork for 2006. "Latinos"-ranging from Spanish speakers of Spanish heritage to those of mixed or largely indigenous background born in the Spanish-speaking Americas-have lived in what is the United States since before the country's independence. Substantial incorporation of Latinos only occurred, however, with the Treaty of Guadalupe Hidalgo that ended the Mexican-American War of 1846-48. The treaty ceded significant proportions of Colorado, Arizona, New Mexico, and Wyoming, as well as all of California, Nevada, and Utah, to the United States, and it forced Mexico to recognize the Rio Grande as the border between Texas and Mexico. In 1850, an estimated 80,000 Mexican Americans lived in the U.S. Southwest, accounting for about 20 percent of the region's population (Nostrand 1975). Although the border was relatively open and unpoliced in this period, migration of Mexicans to the United States was modest. According to official records, 728,000 Mexican moved to the United States between 1901 and 1930 (Bean and Stevens 2003, 49). These migrants, combined with people born in the United States of Mexican heritage, accounted for the 1,423,000 Mexican-origin individuals living in the United States in 1930 (Bean and Stevens 2003, 53). This number would decrease over the subsequent two decades as older generations passed away, new migration was reduced by economic depression and war, and the United States forcibly returned hundreds of thousands of people to Mexico. Despite significant cases of discrimination and strong anti-Latino sentiment in the Southwest in the early twentieth century-including the forced deportation of anywhere between 350,000 and 2 million Mexican immigrants and U.S. citizen Mexican Americans during the Great Depression-there are few accounts of large-scale Latino collective action until the 1960s (Gómez-Quiñones 1990; Balderrama and Rodriguez 1995). In 1929, the League of United Latin American Citizens (LULAC) was formed in Corpus Christi, Texas, the nation's oldest Hispanic advocacy organization still in existence today. In the ten years following World War II, Mexican American activists, working through organizations like LULAC and veterans' associations, won a number of important legal battles, including the landmark 1954 ruling Hernandez v. State of Texas, which declared Mexican Americans entitled to equal protection under the Fourteenth Amendment of the U.S. Constitution (M. T. García 1989). Few of these efforts involved mass protest or contentious political action. What many call the Chicano civil rights movement originated in the 1960s, drawing inspiration from the black civil rights movement. The Chicano movement encompassed three streams. One stream centered on the struggle of the United Farm Workers (UFW), founded in California's Central Valley in 1962 and composed of Mexican, Mexican American, and Filipino migrant farmworkers who used nonviolent direct action to agitate for the right to organize and earn a living wage. At its height, the UFW unionized thousands of farmworkers and recruited and trained hundreds of community organizers and activist leaders. It also reinvigorated social movement tactics like the boycott and hunger strike, and as a result won the passage of the 1975 California Agricultural Labor Relations Act, the only law protecting the collective bargaining rights of agricultural workers in the continental United States (Ganz 2009; Shaw 2008). The second stream was the Chicano nationalist movement, which started in Denver and New Mexico and was committed to etching a new collective understanding of the once-pejorative term Chicano. It also fought for the property rights guaranteed to Mexican citizens living in the Southwest when the United States signed the Treaty of Guadalupe Hidalgo in 1848. The Chicano nationalist movement drew many with its push for political and social inclusion and it helped to spark an artistic renaissance, yet its efforts to unify Mexican Americans around a single collective identity proved an elusive goal. The third stream was the Chicano student movement, which erupted in 1968 when East Los Angeles high school students walked out of their schools. Though student protests were especially visible in California, they also occurred in Texas and New Mexico as well as in Phoenix, Chicago, and Denver. The student blowouts, as they were called, involved thousands of Chicano students protesting against their crumbling schools and the failure of the public education system to reflect their experiences in course material and teaching staff (C. Muñoz 1989; Gómez-Quiñones 1990). From the context of 2006, two important points stand out about the 1960s period. First, the activism of that time largely revolved around the concerns and aspirations of U.S.-born citizens of Mexican or Chicano heritage. These protests were not about immigration. The United Farm Workers, as a union, took stances hostile to immigration in the 1960s and early 1970s. Frustrated at the refusal of the Immigration and Naturalization Service to stop growers from bringing in undocumented immigrants to do the jobs of striking union members, Cesar Chavez testified before Congress in support of employer sanctions in 1966 for those employing illegal immigrants and endorsed tough immigration restrictions proposed in Congress in 1973. Although Chavez later became a strong supporter of immigrant rights (his anti-immigrant stance might more accurately be characterized as "antistrikebreaker"), in its heyday, UFW activism was not focused on immigration (Shaw 2008). Similarly, students agitating for a Chicano curriculum and Latino teachers appealed to the long-standing history of Mexican Americans in the United States, not the plight of new migrants from Mexico and other Spanish-speaking countries. In 1970, only 17 percent of the total U.S. Mexican-origin population was born in Mexico; more than four in five were U.S.-born citizens (Bean and Stevens 2003, 54). A second lesson, however, is that the movements of the 1960s forged a generation of activists who learned to organize, protest, and mobilize people for a cause, and the earlier period provides a historical touchstone to which contemporary activists can appeal. We have some evidence that those active in the UFW and student movement during the 1960s later shifted their energies and organizational skills to take on the issues of immigrants, including the undocumented. In his contribution to this volume, Randy Shaw contends that there is a direct link between the young activists in the UFW and the contemporary immigrant rights movement in Los Angeles, a link also hinted at in this volume's chapters by Ted Wang and Robert Winn and by Luisa Heredia. Lisa Martinez's chapter on Denver alludes to the symbolic importance of the 1960s era for today's activists, reminding us that Denver was home to Rodolfo "Corky" Gonzales's Crusade for Justice in 1966. The Chicano movement and UFW also inspired other activists, such as those who mobilized for Puerto Rican rights and independence in the 1960s and 1970s (Torres and Velasquez 1998), generating organizational activism and norms of contentious political engagement up to the present. Some of those active in these decades also became involved in the sanctuary movement of the 1980s, a concerted mobilization by churches and other groups to assist Central Americans fleeing civil war and to speak out against U.S. foreign intervention in the region (Chinchilla, Hamilton, and Loucky 2009; Coutin 1993; C. Smith 1996b). The sanctuary movement, and the broader Central American peace and solidarity movement of which it was a part, also mobilized new activists, including middle-class Americans with no personal experience with migration. These people, spurred on by humanitarian concern over the fate of Central American migrants, and also often by political views opposing President Reagan's policy in Central America, engaged in a concerted program of civil disobedience. They created various refugee and immigration organizations in the process, built transnational ties to activists in Central America, and adopted religious understandings to frame their actions. All of these activities would find parallels, though in new ways, during the protests of 2006. If the 1960s focused on the U.S.-born Hispanic, and the 1980s on Central Americans fleeing political conflict, today's activism centers on the Latino migrant, especially the undocumented. The shift in focus arose in large part due to the dramatic change in the Latino and Mexican-origin populations that occurred around 1970, as one wave of semiregulated temporary Mexican migration ended and the contemporary wave of diverse, large-scale legal and unauthorized Latino migration began. The first postwar wave of migration began in 1942, when the U.S. government began what would be called the Bracero Program, a series of agreements with Mexico and Caribbean countries to import temporary foreign labor to fill war-related employment shortages, especially in the agriculture and railway sectors. From 1942 to 1964, when the program was formally ended, approximately 4.6 million Mexican-born workers came to the United States through official or informal channels (Calavita 1992; Tichenor 2002, 210). The Bracero Program instituted a pattern of temporary, cyclical migration, largely of male laborers, on which U.S. agricultural interests came to rely. It also generated a "culture of migration" (Kandel and Massey 2002; Massey et al. 1998) that established a norm of migration to "el Norte" for certain Mexican communities. The end of this program laid the groundwork for contemporary, large-scale undocumented migration (Massey, Durand, and Malone 2002). Despite bracero migration, in 1970 those born in Mexico only made up about 8 percent of all foreign-born individuals living in the United States, while Latinos (then commonly referred to as Hispanics) numbered about 9.6 million out of a total U.S. population of about 206 million, or 4.7 percent (Bean and Stevens 2003, 22). By 1980, the proportion of Hispanics had increased more than 50 percent; by 1990 the number reached 22.3 million; and by 2000, 37.7 million (Bean and Stevens 2003, 22). High fertility rates among those of Hispanic or Latino origin accounted for part of the rise, but immigration was a major motor: considering just Mexican migration, in 2000 there were 8.8 million Mexican-born individuals living in the United States, who made up about 29 percent of the total immigrant population and also accounted for 41 percent of the Mexican-origin population in the United States (Bean and Stevens 2003, 54). The dramatic increase in Mexican migration is part of a more general surge in immigration to the United States over the last four decades. In 1965, American immigration law underwent a radical overhaul after Congress passed the Immigration and Nationality (or Hart-Cellar) Act. This act restricted, for the first time, migration from the "Western Hemisphere," which included Mexico, Central America, South America, and the Caribbean, imposing a ceiling of 120,000 legal permanent resident visas per annum. Conversely, the law removed discriminatory quotas on the rest of the world, or the "Eastern Hemisphere," finally opening the door to large-scale Asian migration. It also opened the door, outside the annual admission ceilings set by Congress, to the spouses, minor children, and parents of U.S. citizens. The 1965 act allowed many people previously shut out of the United States to migrate legally, especially through the use of family sponsorship provisions. Immigrants from around the world, including from Mexico and Latin America, used family reunification to bring relatives to the United States. But the ensuing decades also saw a significant increase in undocumented migration. With the end of the Bracero Program, limited temporary work visas, a new Western Hemisphere ceiling, continued American demand for low-skilled labor, and limited economic development in Latin America, it is not surprising that undocumented migration began to grow. This trend was exacerbated in the early 1980s when Central Americans, fleeing war and upheaval in El Salvador, Guatemala, and Nicaragua, came to the United States. Central Americans, seen by numerous civil society groups and by themselves as political refugees, were generally viewed by the U.S. government as economic migrants: less than 5 percent had their claims of asylum accepted in the 1980s (M. C. García 2006). Hundreds of thousands, unwilling to go back to war and persecution in their homelands, instead went underground, joining the burgeoning undocumented population. Later, after extended activism by churches, lawyers, and other civil society activists, many received Temporary Protected Status and related designations through special legislation passed by Congress or following the out-of-court settlement of a class action lawsuit that required the federal government to reopen 150,000 asylum cases (known as the ABC case, or American Baptist Churches v. Thornburgh). For some, these legislative and judicial victories led to permanent legal status, but others remain in a legal limbo between unauthorized status and legal permanent residence (Menjívar 2000, 2006). The dramatic upsurge in undocumented migration led in 1986 to the first large-scale U.S. amnesty for those living in the United States without authorization. In 1986, Congress passed the Immigration Reform and Control Act (IRCA) which, depending on one's perspective, was a careful or convoluted compromise between a myriad of political actors and interests. Two main provisions were the introduction, for the first time, of sanctions for employers knowingly hiring undocumented workers and legalization of about three million people, approximately three-quarters of them born in Mexico (Martin 1994). Quickly, however, evidence mounted that IRCA had not eliminated illegal migration. Researchers instead found weak oversight of employers and very little enforcement of IRCA in workplaces (Brownell 2005; Fix 1991). Further, as the U.S. government stepped up efforts to control the southern border through more border control officers, new fencing, and other techniques to deter clandestine entry, the cost of unauthorized border crossing-both financial and human-increased. This impeded historical patterns of circular migration and led families of undocumented migrants to risk deserts, mountains, and other dangerous crossing schemes to join those working-and now staying-in the United States (Cornelius 2001, 2005). One of the states most heavily affected by migration, both legal and unauthorized, was California, and it is perhaps not surprising that this state would be home to the first volley of the anti-immigrant backlash of the 1990s. In 1994, California voters overwhelmingly passed Proposition 187, an initiative to deny illegal immigrants all social services, including health care and public education. Championed by the incumbent Republican governor, Pete Wilson, as a central part of his reelection strategy, the measure was widely perceived as targeting all Latino migrants, not just undocumented, and it sparked the largest mass protests and school walkouts since the Chicano movement, by some estimates spurring 70,000 people into the streets (García Bedolla 2005, 29-31; McDonnell and López 1994). Although the initiative was later overturned by the courts as unconstitutional, its success at the polls emboldened conservative groups even as it spurred higher rates of naturalization, voter registration, and voter turnout among legal Latino immigrants (Pantoja, Ramírez, and Segura 2001; Ramakrishnan 2005). In 1996, some of the same Republican groups that had sponsored Proposition 187 penned Proposition 209, aimed at ending affirmative action in the state, which also won voter approval; then, in 1998, Proposition 227 ended bilingual education in the state, with a resounding 61 percent of the vote. Although the anti-immigrant backlash began in California, the rapidly growing immigrant population and its spread to all areas of the United States had ripple effects on the national stage. In 1996, the U.S. Congress passed, and President Bill Clinton signed, two pieces of legislation with far-reaching consequences for migrants, both legal and unauthorized: the Personal Responsibility and Work Opportunity Reconciliation Act of 1996 (PRWORA) and the Illegal Immigration Reform and Immigrant Responsibility Act of 1996 (IIRIRA). These laws marked two important turning points in the U.S. government's attitude toward noncitizen migrants: they underscored the importance of citizenship as the only secure protection against removal and exclusion from the United States as well as the only guarantee to social benefits, and they reinforced the marginal status of unauthorized migrants by making them ineligible for most social benefits as well as taking away the ability to appeal immigration decisions. PRWORA, more commonly known as the Welfare Reform Act, was signed into law first, on August 22, 1996. Its stated purpose was to change the system of federal cash assistance to the poor by instituting lifetime limits to benefits and mandating new work requirements for those receiving benefits. However, an entire section of the act, Title IV, focuses on noncitizens, including legal permanent residents, refugees, and undocumented migrants. The law effectively barred undocumented migrants from most forms of state support and ended a decades-old policy of treating legal permanent residents in the United States as citizens for social benefits like Supplemental Security Income, food stamps, Medicaid, and cash benefits (Singer 2004b). In sharpening the distinction between citizens and noncitizens, the United States bucked an apparent trend in other Western industrialized countries where social benefits depend more on long-term legal residence than citizenship, and where some rights rely on personhood rather than state-based membership through citizenship (Fix and Laglagaron 2002; Soysal 1994). In parallel, congressional and White House attention to border control increased with IIRIRA, signed into law on September 30, 1996. It authorized substantial new hires of border control officers, new border control technology, and more money for fencing. It severely limited legal recourse against exclusion and deportation for apprehended undocumented migrants and for all noncitizen immigrants, legal or unauthorized, convicted of crimes. The technical and legal nature of the law rendered it largely invisible to the public eye, but among legal experts it was seen as a radical change, leading some to talk about the criminalization of the U.S. immigration system (see, e.g., Emory Law Journal 2002). The trend toward criminalization gained further steam following the terrorist attacks of September 11, 2001, providing a decade-long precedent for the further criminalization of migration proposed under H.R. 4437, the immediate catalyst for the spring 2006 immigration rights protests. As was the case in California, there is evidence that the federal attack on noncitizens' social and legal rights resulted in increased naturalization and the development of a new generation of immigrant rights activists across the country. Fix, Passel, and Sucher (2003) estimate that after a precipitous drop in immigrant naturalization levels from 64 percent of those eligible in 1970 to 39 percent in 1996, citizenship levels among legal immigrants rose to 49 percent by 2002. The increase was likely fueled by noncitizens' fears over anti-immigrant legislation and facilitated by the greater attention to and funding for naturalization provided by nonprofit organizations and state governments after 1996. We also have piecemeal evidence that, as with the activists of the 1960s, some of the youth politicized by opposing anti-immigrant legislation in the 1990s went on to play a role in the mobilizations of 2006 (Oliver 2006; Wang and Winn, this volume). From Alaska to Florida, millions of immigrants and their supporters took to the streets across the United States to rally for immigrant rights in the spring of 2006. The scope and size of their protests, rallies, and boycotts made these the most significant events of political activism in the United States since the 1960s. This accessibly written volume offers the first comprehensive analysis of this historic moment. Perfect for students and general readers, its essays, written by a multidisciplinary group of scholars and grassroots organizers, trace the evolution and legacy of the 2006 protest movement in engaging, theoretically informed discussions. The contributors cover topics including unions, churches, the media, immigrant organizations, and immigrant politics. Today, one in eight U.S. residents was born outside the country, but for many, lack of citizenship makes political voice through the ballot box impossible. This book helps us better understand how immigrants are making their voices heard in other ways. Kim Voss is Professor in the Department of Sociology at the University of California, Berkeley. She is coauthor, with Rick Fantasia, of Hard Work: Remaking the American Labor Movement (UC Press), coauthor of Inequality by Design, and author of The Making of American Exceptionalism. Irene Bloemraad is Associate Professor of Sociology at the University of California, Berkeley. She is author of Becoming a Citizen: Incorporating Immigrants and Refugees in the United States and Canada (UC Press). 1. The Protests of 2006: What Were They, How Do We Understand Them, Where Do We Go? Looking Forward: Whither American Politics and Immigrant Rights Mobilization?